Q and A with Mark Baillie from Hell Bay Brewing Co.
Hell Bay Brewing recently announced expansion plans. I’ve recently exchanged emails with owner Mark Baillie in order to complete this interview. Atlantic Canada Beer Blogger (ACBB): How did you decide to open a brewery? Mark Baillie (MB): Opening a brewery or brew pub, was always a thought in the back my mind, since my first time home brewing. My wife and I both having culinary backgrounds, kicked the brew pub idea around for a while before deciding on a production brewery, thinking that we’ll take it one step at a time, as a brewpub really is two businesses rolled into one. So I started looking into how to get started, and how to finance it. The financing became a more challenging obstacle so we started small, with a 30gal. system. That system only lasted about 5 months before we had to up our production to our current system which is a mix of tanks and fermenters we acquired from Paddy’s Pub that include a couple of 300L and 600L fermenters, tanks, etc. ACBB: How many batches of beer did you make before going pro? MB: I don’t really know how many batches I brewed before going pro, but I brewed for approx. 10-12 years. ACBB:Did you have any support from any local brewers in getting your operation started? MB: When we started we kept everything rather “low key” mainly because of the limited capacity of the brew system. ACBB: Can you tell me about your current production? MB: We are currently producing approx. between 12 – 18hl/mo, between 200-300hl/year. We brew 3hl batches at least once a week. We acquired the tanks and fermenters from a local brewpub, and cobbled together everything else, literally, including homemade labeler, bottle washer, stir-plates, and the list goes on. ACBB: Do you have any plans for any new beers? MB: I’m always planning for new beers, once we make the move to Liverpool, I’m planning on having 3-4 core brands, the English Ale of course, I’d like to keep a darker beer on as a regular perhaps a stout or the dark cream ale which was well received, and a lighter one we may keep the pale ale for that or create something else and use the pale as a seasonal. And as mentioned a rotating seasonal to keep things interesting. ACBB: How do you approach recipes for your beers? MB: New recipes, I will sometimes make a smaller batch (20l) then scale it up, and sometimes (more often) make the full batch. As for resources, I use brewing books that I have acquired of the years, and the internet. I am planning on taking a brewing course from Seibel Institute in the new year, that will also be a valuable resource and foundation. ACBB: Other than your own beers, what are your favorites? MB: Other than my beers, I tend to drink the local offerings like Garrison, Rudder’s, Sea Level, and all of the Atlantic Canadian breweries, as well as the other Canadian Craft beers when I can get my hands on a bottle. And that is pretty much it, I’ll try an American or foreign brew every now and then, but when there is so many good beers within our own country I tend to stick to them. ACBB: Do you use any local supplies for your beer or equipment at your brewery? MB: We try to use Atlantic Canadian suppliers as much as possible, we get hops in fall from local farmers, and currently have a local wood working shop making tap handles for us, etc. ACBB: Can you tell me about your expansion plans? MB: The expansion in Liverpool will entail our current 6hl brewhouse, along with 10 bbl fermenters. Upgraded bottle and kegging systems, and necessary equipment to brew at that scale.With the increased production, we will be able to get our beer on tap in more locations, such as Halifax and elsewhere. Our bottled production will increase as well so we can supply more bars and restaurants and possibly the NSLC. Even with the expansion, we are still a very small operation, so we probably won’t be distributing outside of the province for now. Check out the Hell Bay website for a description of their English Ale and Pale Ale beers. 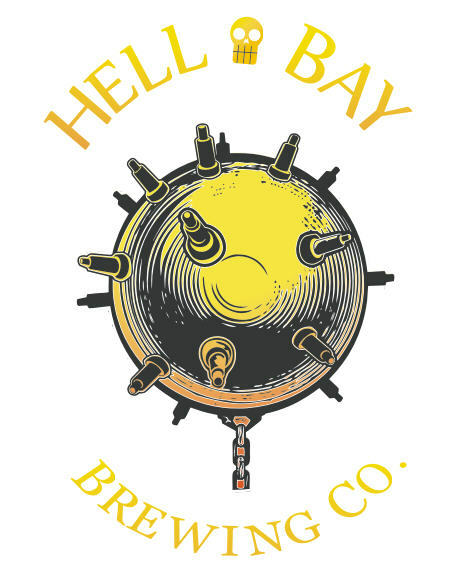 You can follow them on Facebook and on Twitter ( @HellBayBrewing ). ← Q and A with Stephen Dixon from Grimross Brewing Co. Some of the best beer around is from Hell Bay Brewing.